Mispronouncing a word, especially a name from the creative fields, is the ultimate faux pas. There are countless examples in fashion, many of them spoken very quickly in conversation, in the hope the listener won't pick up on their mistake. In this new bi-monthly column, AnOther aims to deliver the official pronunciation of names of leading figures, with phonetic pronunciations and their origins. Elsa Schiaparelli, the woman responsible for the "shoe hat" and "skeleton dress", is one of the most commonly mispronounced surnames in fashion history. 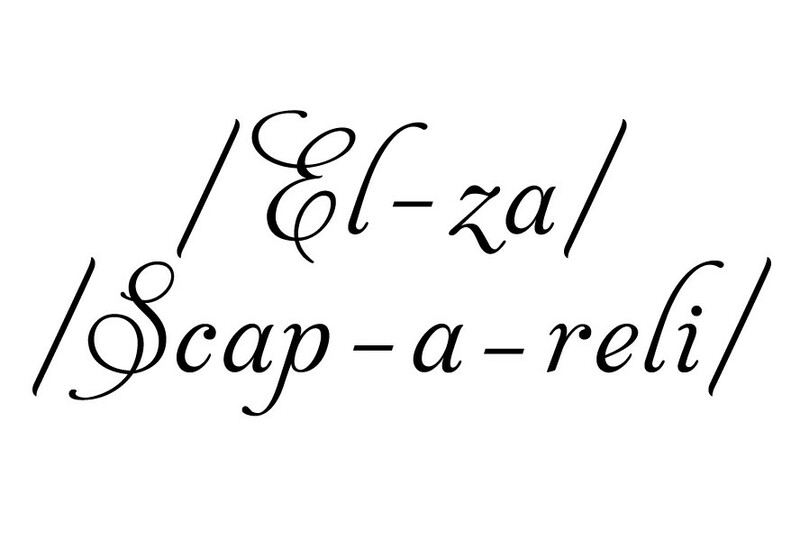 Its formal pronunciation is scap-a-reli. The initial consonant cluster Schia is a hard c sound in Italian; secondary stress on ska and full stress on -relli. A common mispronunciation is schap-a-relli. Her first name, Elsa, meaning joyful and originally a diminutive of Elizabeth, was pronounced el-za, a modest zedding of the s in Elsa. She was especially fond of her nickname "Schiap" (pronounced skap) used by those closest to her. She once said, "I merely know Schiap by hearsay. I have only seen her in a mirror. She is, for me, some kind of fifth dimension." Encouraged to start work as a designer by Paul Poiret in the late 1920s, Schiaparelli went on to create innovative clothes and accessories between 1927 until 1954. She was heavily influenced by Surrealism collaborating with artists such as Salvador Dali and Jean Cocteau and was the first fashion designer to use brightly coloured zips as a fashion feature and fancy buttons (in the shape of bees and ram's heads). She created standout wedge-shoes in collaboration with the French shoe house Pérugia. Her influence continued long after her house closed, in the collections of the late Yves Saint Laurent, Jean Paul Gaultier, Marc Jacobs, Comme des Garçons and milliner Stephen Jones. Schiaparelli came from an elite, intellectual Italian family. Her mother was a Neapolitan aristocrat and her father a renowned scholar and curator of medieval manuscripts. Her father, Celestino, was Dean of the University of Rome and an authority on Sanskrit. She was a niece of astronomer Giovanni Schiaparelli, who discovered the canali of Mars, and she spent hours with him studying the heavens. There are many possible origins of the Schiaparelli name, including the Latin adjective scaber (meaning rough), which would go into Italian as, first, scapro, later schiapro or schiaparo (same pronunciation as scapro); a descent from the Italian word schiappa (meaning splinter) or possibly evolved from the common Jewish surname Shapiro. With special thanks to Judith Watt. Her book, Vogue On Elsa Schiaparelli is to be published in 2012 by Quadrille Publishing.